Upgrade your editor to the new Updated Editor. To do this, go to Dashboard (Old interface) - Settings - Basic - Select Post Editor - Updated Editor - Save Settings. Click here for a brief overview of the Updated Editor. Create a new post. Click on the Upload Image Icon. If you can't see this icon, make sure you're in Compose mode (as opposed to Edit HTML mode). Click on 'Choose files.' You will be able to browse your computer for images now. 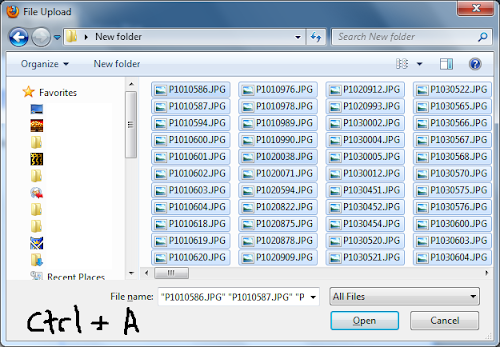 To upload multiple images at one go, just select more than a picture at one time. You can do this by creating a select box (click and drag on an empty space) around your pictures. 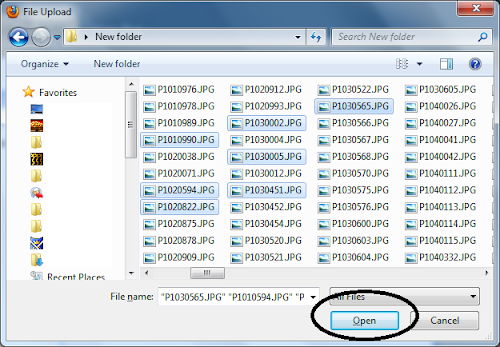 Or you can select all the pictures that you have in a folder by clicking on 'CTRL + A' (or right click on an empty space - Select All). 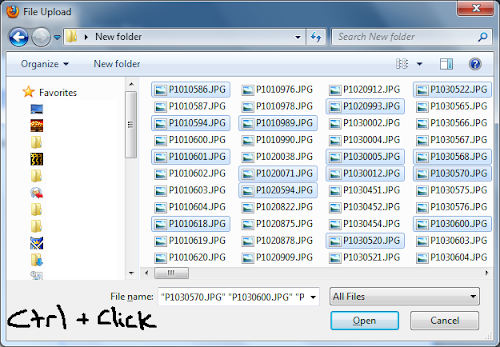 Or you can handpick few images from a group of images, by clicking on the images that you want while holding the 'CTRL' key on your keyboard. Click on 'Open' when you've done selecting your pictures. 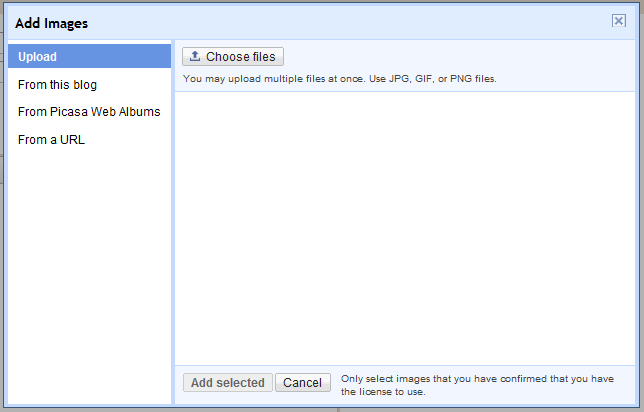 The editor should upload your images to your Picasa Web Album automatically. Once it's done, just choose the images that you want to place to your post. By default, all of them are selected. I hope this helps. Happy uploading. yes i did it. this is exciting!! thank you. Cindy: I am not sure if I fully understand what you meant by 'folders'. 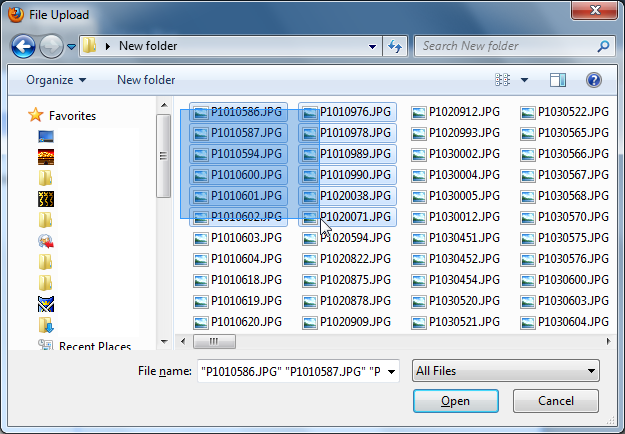 What kind of folders are you referring to? If I had to guess, I think you are trying to categorize your posts. In that case, before publishing your post, add a label to it. You can add labels at the bottom of your post editor. This is how you will be categorizing them. For example, if your post is about landscape images, then add 'landscape' as your label. 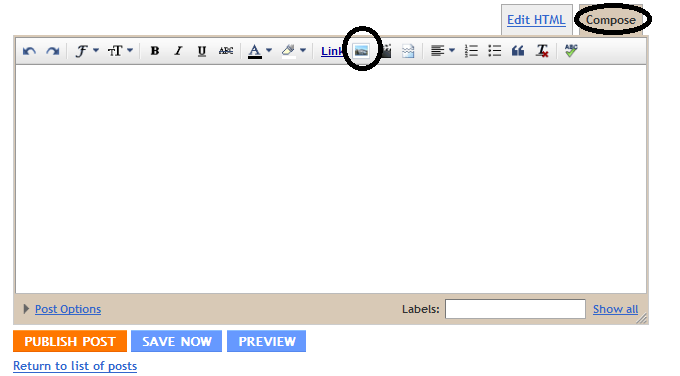 Then, use a link list gadget to add a link to your label page. So when a person clicks on that link, a page that has all the posts labeled 'landscape' will show up.I have a detailed tutorial on this here. Also, should you have more questions like this, it will be a good idea to post it in Blogger Help Forum. i've been trying to do my pics like in the caramel apple cake post in my blog. i want it like that. smaller pics in the middle on either side with text in between. i fiddled with caramel apple cake small pics and it "happened" to come about like that. 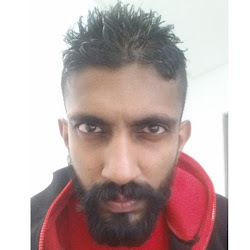 i tried doing it for my latest post by clicking and dragging the small pic. but it's some crazy. how do you do it? kitchenmorph: I've never tried to post pictures like that, so I quickly tried to publish a post in that manner, and I was able to do it. I think. First, upload your picture into the editor. Click once and make it small. Then click one more time to align it to the right (or left). By default it is placed in the center. Then I just started to type and it appeared beside the picture. Are you having trouble doing this? Perhaps you've missed the aligning part? Hello :D I have a quick question. My blog is already on this setting, but for some reason I can never get my images to upload. They simply load for forever. Is this a problem with my blog? I'm not sure if it's that or maybe my internet. It's frustrating not being able to upload pictures from my computer. @Kelsey: What browser are you using? I think Blogger works best with Firefox and Google Chrome. And worst in Internet Explorer 9. Hey this is really helpful. Thank you very much. @Me and My Life: No problem at all. Cheers and od bless. How do you upload multiple URL's at one time? 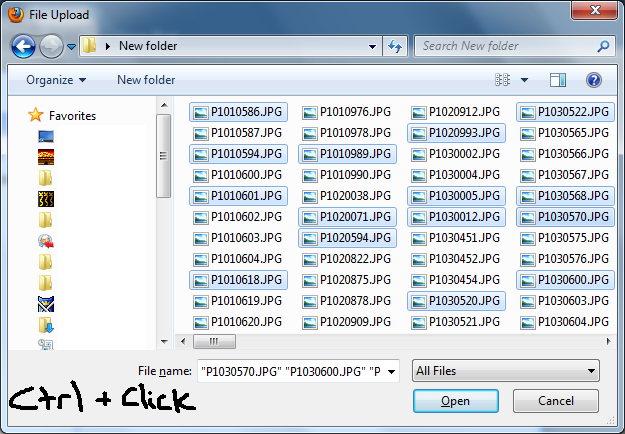 If you were referring to fetching images from a URL, I'm afraid you're gonna have to do it one by one at the moment. 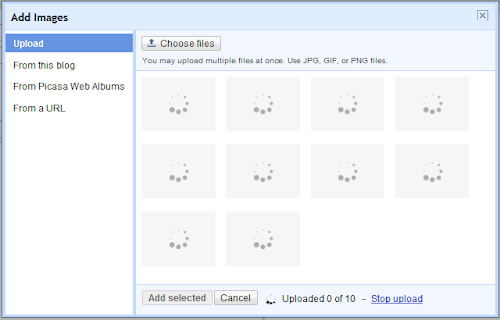 Or, you could download the images to your computer, and batch upload them to Blogger. I am stuck every time when i select all photos and when it completes the uploading and when i try to click on Add Selected it wont add pictures it add only one or 2 images at a time what is this problem? It could be a browser problem. Have you tried using a different browser? Try Chrome or Firefox.. This doesn't seem to work for me. I used to be able to upload multiple photos at one go but recently, there seems to be a problem. After clicking the image icon, it only states ' You can upload JPG, GIF or PNG files' instead of " You may upload multiple files at once. You can upload JPG, GIF or PNG files". Have you tried using a different browser to see if this is a browser problem? Thank you! I didn't realize my browser might be the issue behind blogger's annoying photo upload! i switched to google chrome and my problems are solved. thanks for the tip!! When I go to the "add images" screen, section "upload", I do not have a "choose files" option. Why? But, i want to upload 3 pictures in one row, then in second line again i want to upload 3 pictures in one row, like table. like this. u know what i mean...?